Two years back we had a Thanksgiving bird emergency, with a Turkey that wasn’t defrosting in-time and a lot of hungry people already gathered it made for quite a stressful situation. I’ve seen this on many different sitcoms and yes, it really happens! If you find yourself in this predicament don’t panic, you can still enjoy some T-Day white meat with a quick chicken recipe. Chicken works well also if you just aren’t a turkey fan, or if you just want something quick to prepare. I paired the chicken with potatoes, but chicken fits right in with stuffing, green bean casserole and all of the other traditional components of a Thanksgiving dinner. 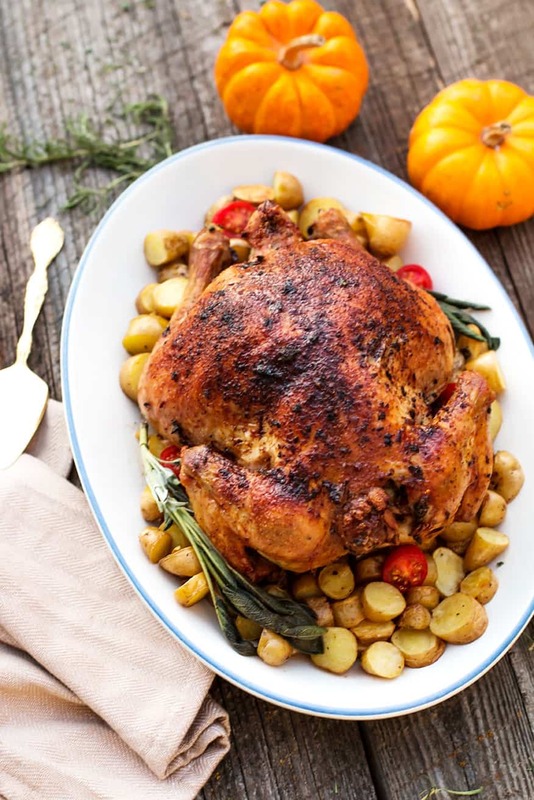 Many people buy rotisserie chickens from different stores around town. It is extremely convenient, but if I have a just that little bit of time that it takes to make my own I really prefer to do so. I love being able to regulate exactly what ingredients are put into a dish, and on that note when I make it home there isn’t an overbearing salty taste. I baked the potatoes in the oven separately, but brought them together on the plate as the juices from the chicken make each bite of the potatoes all that much better. Finely chop lemon peel, sage and garlic. Then add butter, garlic powder and kosher salt. Stir to combine. Using your fingertips, loosen skin from breast. Rub outer skin, breast, wing and thigh areas with sage butter mixture. Rub remaining butter onto skin under the chicken. Use most of it on the outside to get crispy skin. Preheat the oven to 475°. Cut the potatoes in quarters and rub with the olive oil, minced garlic, garlic powder, salt and pepper. Transfer the potatoes to a baking pan and roast for 35 minutes or until browned and crisp. This looks good enough to eat! I think I could make this on the turkey and have a hit on my hands. YUM! Oh man, this looks sound amazing. I have to try serving chicken like this with plenty of extra potatoes! Everything about that sounds amazing! Sage and garlic are the best thing ever with chicken. Yum! I dont like chicken on the bone. Im very picky. But I think this looks so good, like I would probably try it. That looks absolutely delicious! This exactly the type of meal that my family loves. I’m saving this recipe for later! Chicken is a go to for my family pretty much 3/4 of the week. The idea and flavor combinations here sound absolutely amazing and I really can’t wait ot give it a try and see what everyone else thinks! My eldest son’s favorite is rotisserie chicken. When I do not have time to make it myself, he usually drives down to the supermarket to get one. I will try your recipe. I think chicken, potatoes and garlic would really be tasty! That looks so yummy! I tried this with sage, thyme and rosemary and it was also good. What a delicious looking chicken! I will have to try this recipe soon; it looks amazing! Now this looks amazing!! I LOVE chicken!! Great post!! I really like the taste of sage! I will have to make some. Looks really good! Looks delicious! I’m saving this one for future plans of cooking. I definitely love chicken and potatoes! This is a hearty looking recipe. It would be great for a cold winter day for sure. This looks delicious. We love chicken in our house. I’m always on the lookout for new recipes. This is seriously screaming ‘get in my belly’. That is one gorgeous bird! Mmmmm, sounds incredible. The sage butter and garlic sounds yummy. Will definitely pass that on to my hubby so he can make that for us. Thank you for sharing. I love rotisserie chicken. And I bet it’s heavenly with garlic and sage in it. I am hungry just thinking about it. Wow. That looks so amazing! I will have to get my hubby to make this for me! Now, talk about something perfect to eat with the whole gang or family, haha! I love the combination how it was done, love it. This looks divine. Definitely trying this recipe for dinner one of these days, my daughter loves chicken. My absolute FAVORITE. I love making roast chicken with lots of garlic. Chicken looks great, nice color. What kind of potatoes did you use? I prefer small potatoes like these to the larger ones. That chicken looks like it baked to perfection! It looks so great! Thank you for sharing your recipe and your Thanksgiving story. I buy them all the time but I never thought about making one myself. I will give this one a try and save some money. This is perfect! 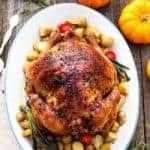 I can pick up a roaster chicken for pretty cheap every few weeks as they go on sale and I love the flavors of sage and garlic. I’ll be giving this a try for one of Sunday family dinners! Oh wow! 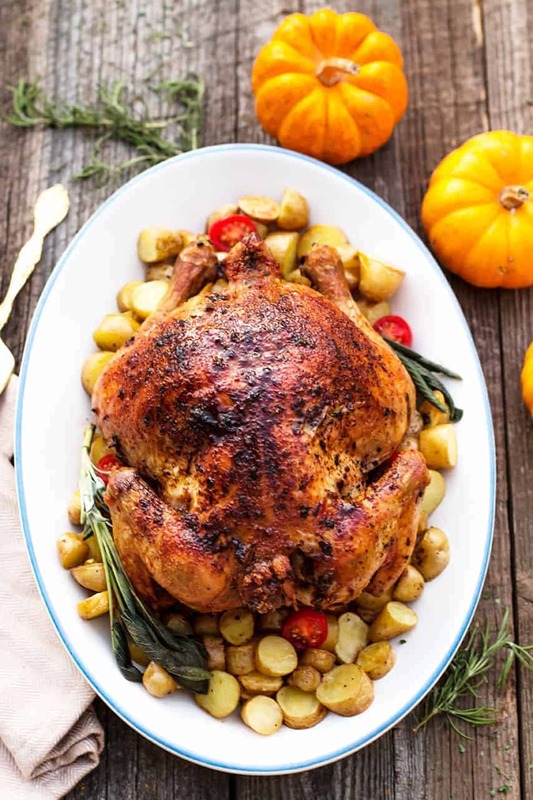 this is the prettiest roasted chicken I’ve ever seen!